Deltapine T-Shirt – Create a MyStrongCotton story and fill in the required fields to request a free Deltapine t-shirt by mail. AddPoll – Request a free Addpoll t-shirt by mail. At Addpoll you can create stunning surveys, polls and forms in seconds. Fast & easy! Suny Cortland Athletics Kids’ Club – Students 8th grade and younger can get multiple freebies including a free t-shirt. Follow the instructions on their page to make your request. Trust Me, I’m Almost a Nurse – Fill out the form on BoardVitals webpage to request a free “Trust Me I Am Almost a Nurse” tshirt. Carharrt T-shirt – Submit three sentences on how you get work done in extreme cold conditions and a photo and receive a free Carharrt t-shirt. 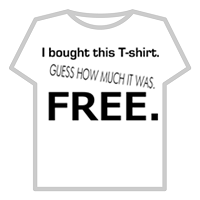 I guess this one is a little work but I we get a free t-shirt it is worth it. You may not want to wear only this t-shirt though if you are working in extreme cold conditions. Dutch Masters – If it doesn’t work right away try another email address. Just answer a few questions to help them confirm you are a smoker and at least 21 years old and you’ll be able to sign up for a free Dutch Masters t-shirt or hat. Once you register for the site the free sample form will pop up. Available while supplies last. Young Americans for Liberty – Fill out the form on Young American’s for Liberty to request a free t-shirt. Available while supplies last.